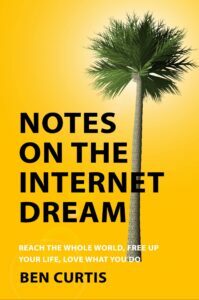 My book Notes on the Internet Dream is available now on Amazon in Kindle and Paperback formats! Buy now from Amazon: Amazon.com – Amazon.co.uk – Amazon.es – and all other Amazon stores. The book tells the story of the ‘aha’ moments that led Marina and I (Ben) to start Notes in Spanish over 10 years ago, to leave our real jobs, reach 31+ million downloads, and pay off the mortgage. It contains inspiring ideas about how to easily start an online business (or any project! ), a complete walk-through of how the website works and how we earn a living, plus a ‘philosophical’ section on things like working from home, how much money a business needs to generate, ‘moral marketing’, and what to do when an online business finally frees up lots of your time. It’s the personal advice, secrets, techniques and information I share with close friends who want to start something online or get a business off the ground. The book is in English and is out now. P.S. If you read and enjoy the book then I have a big favour to ask – please pop back to Amazon to leave a review!